Cinco Ranch is an 8,000 acre master-planned community known for its gorgeous homes and great amenities. 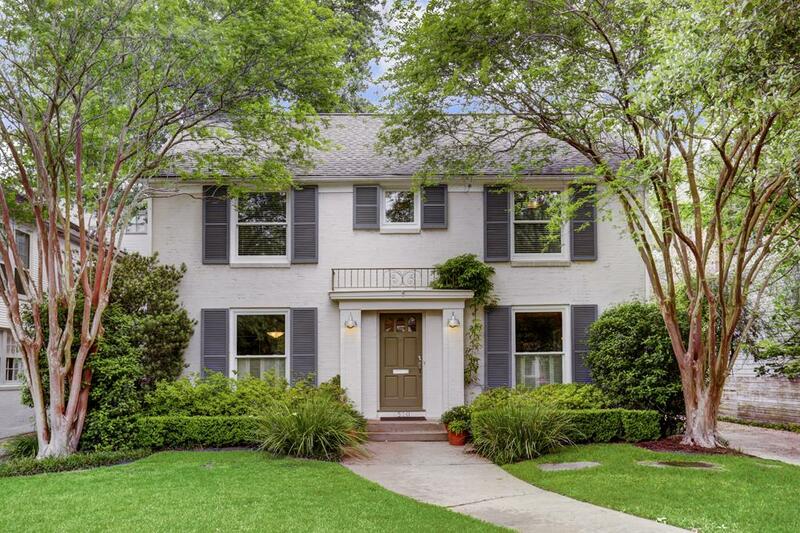 EXCELLENT SCHOOLS: Cinco Ranch homes are zoned to the Katy Independent School District. Many of the KISD public schools are among the Best Houston Schools. Most of the community’s neighborhood schools also have been named National Blue Ribbon Schools. GREAT COMMUNITY AMENITIES: The master-planned community features several parks, pools, tennis courts, and hike and bike trails. Some sections of Cinco Ranch also feature recreational centers and water parks. WIDE RANGE OF HOMES: Katy is one of Houston’s Best Suburbs and the area is home to many quality single-family homes on large lots. Several new home builders offer a variety of options within Cinco Ranch, from townhomes and bungalows to gorgeous estates and manors. EXCITING RETAIL OPTIONS: LaCenterra at Cinco Ranch covers a 34-acre area west of Grand Parkway. It features several dining and retail establishments, spread over 300,000 square feet of commercial space. The mixed use development also features office space and apartments. GREAT ACCESSIBILITY: Cinco Ranch homes are minutes away from major freeways and thoroughfares, including Grand Parkway, Interstate 10, and Westpark Tollway. Cinco Ranch is still growing and with more new sections and new construction homes on the way, the area’s real estate market can be tricky to navigate. Contacting the best Cinco Ranch realtor can benefit homebuyers looking for great recommendations and advice. 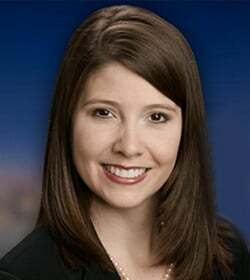 For any inquiries about Cinco Ranch homes recommendations, or off-market MLS listings, get in touch with Paige Martin, head of the Houston Properties Team and one of the best realtors in Houston. 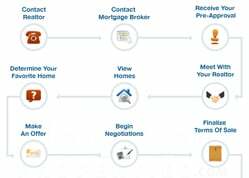 I am interested in Cinco Ranch and would like to get more details. Nestled along Grand Parkway, Cinco Ranch is a sprawling master-planned community southeast of the city of Katy and west of Houston. Cinco Ranch homes are zoned to the Katy Independent School District. Most of the community’s neighborhood schools have been named National Blue Ribbon Schools. The master-planned community features several parks, pools, tennis courts, and hike and bike trails. Some sections of Cinco Ranch also feature recreational centers and water parks. Several new home builders offer a variety of options within Cinco Ranch, from townhomes and bungalows to gorgeous estates and manors. LaCenterra at Cinco Ranch covers a 34-acre area west of Grand Parkway. It features several dining and retail establishments, spread over 300,000 square feet of commercial space. The mixed use development also features office space and apartments. Cinco Ranch homes are minutes away from major freeways and thoroughfares, including Grand Parkway, Interstate 10, and Westpark Tollway. Previously a working ranch, Cinco Ranch was named for the 5 oilmen who purchased the vast acreage from its original owners. The master-planned community is now under Newland Communities. Upon completion, Cinco Ranch will have over 14,000 homes. Cinco Ranch homes are mostly detached single-family dwellings, with some townhome units available in some sections. Lot sizes vary, ranging from 5,000 to more than 25,000 square feet. Homes in the area typically feature 3- to 4-bedroom floor plans. The most expensive Cinco Ranch real estate can feature as many as 5 to 6 bedrooms. Most Cinco Ranch homes feature traditional aesthetics, but some offer more contemporary designs. Prices for Cinco Ranch homes for sale typically start at around $200,000. Bigger and newer properties can sell for just under $2,000,000. Cinco Ranch is nestled in the area about 5 miles southeast of the city of Katy (Old Towne). It spans more than 8,000 acres with newer sections to the west. 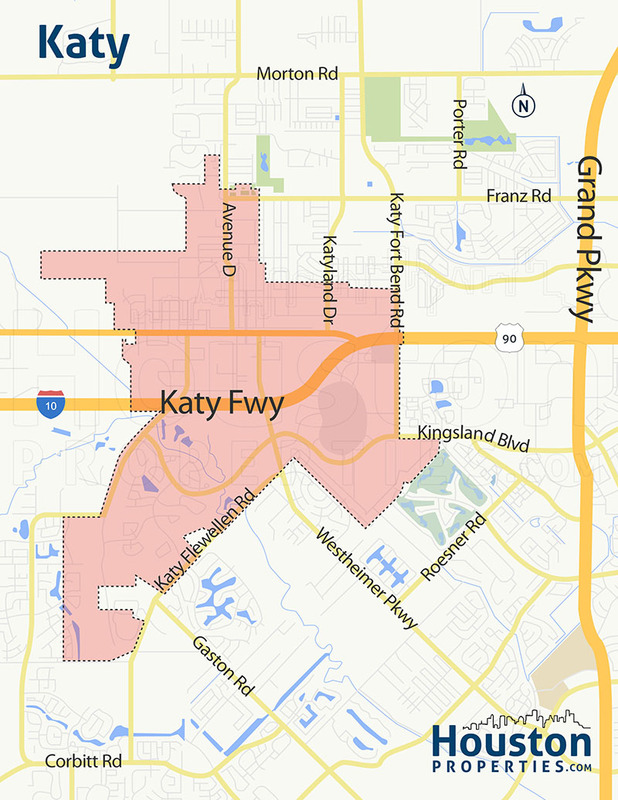 It sits in an unincorporated area in Harris and Fort Bend counties, within what is known as Greater Katy. 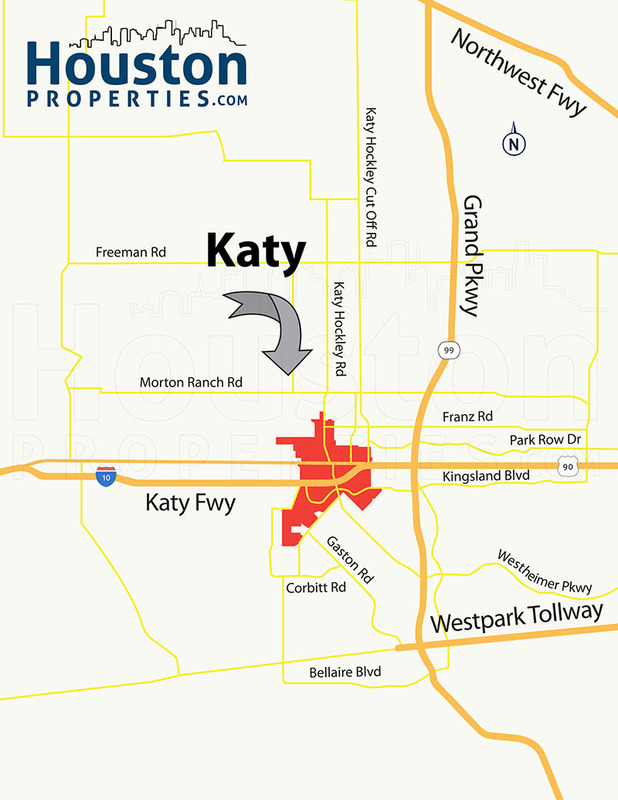 This area is within the 181-square mile boundary of Katy ISD. Located about 26 miles west of downtown Houston, Cinco Ranch is bisected by Grand Parkway, north of Westpark Tollway and south of Interstate 10. The area features a number of other master-planned communities, including Grand Lakes, Seven Meadows, and Cross Creek Ranch, among others. The master-planned community is divided into smaller neighborhoods, which are further divided into several sections. Its newer additions are located west of Grand Parkway, including Cinco Ranch Northwest, Southwest, and West. Cinco Ranch homes are minutes away from community pools, parks, greenbelts, trails, and other amenities. The community also has dedicated areas for retail, dining, and entertainment. Employment and business centers are also highly accessible from Cinco Ranch homes. The Energy Corridor, Katy, and Westchase are all within driving distance. Cinco Ranch homes are zoned to Katy Independent School District (KISD), a district rated by the Texas Education Agency as “Recognized”. Cinco Ranch is served by 11 elementary, 6 middle, and 4 high schools. The community has 3 high schools, 4 junior high schools, and 8 elementary schools within its borders. 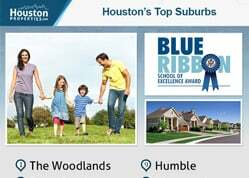 *Note: Due to the number of schools serving Cinco Ranch homes, we opted to list them and highlight those that have been named National Blue Ribbon School. Odessa Kilpatrick Elementary School at 26100 Cinco Ranch Blvd. Sue Creech Elementary School at 5905 S Mason Rd. Jo Ella Exley Elementary School at 21800 Westheimer Pkwy. Fred and Patti Shafer Elementary School at 5150 Ranch Point Dr.
James E. Williams Elementary School at 3900 S Peek Rd. Roberta Wright Rylander Elementary School at 24831 Westheimer Pkwy. Ray and Jamie Wolman Elementary School at 28727 N Firethorne Rd. WoodCreek Elementary School at 1155 Woodcreek Bend Ln. Michael Griffin Elementary School at 7800 S Fry Rd. Seven Lakes Junior High School at 6026 Cinco Ranch-Gaston Rd. Beckendorff Junior High School at 8200 S Fry Rd. Cinco Ranch Junior High School at 23420 Cinco Ranch Blvd. Garland McMeans Junior High School at 21000 Westheimer Pkwy. Woodcreek Junior High School at 1801 Woodcreek Bend Ln. Seven Lakes High School at 9251 S Fry Rd. Obra D. Tompkins High School at 4400 Falcon Landing Blvd. 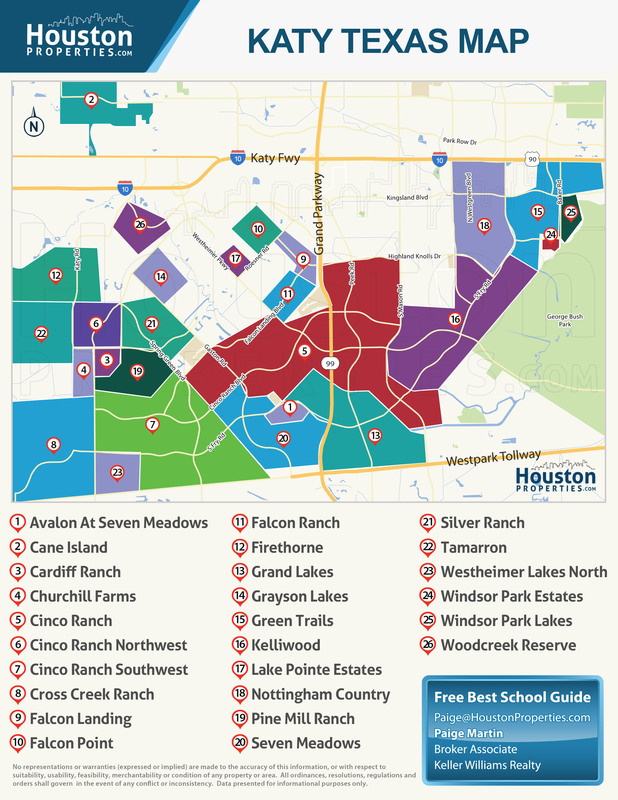 The following are some of the more notable private schools near Cinco Ranch. The Goddard School at 24025 Cinco Village Center Blvd. The British Private Prep School at 4025 S Mason Rd. Harmony Science Academy – West Houston at 22400 Grand Corner Dr.
To find an updated listing of all Cinco Ranch real estate zoned to any specific public school, please send an email to Paige Martin at Paige@HoustonProperties.com with the property preference and budget that you’re working with. Cinco Ranch real estate have posted steady appreciation in the last 10 years. Thanks to continued development in the master-planned community, the median sales price of Cinco Ranch homes for sale have increased to more than $350,000. Apart from recent expansions west of Grand Parkway, several other factors contribute to the community’s continued popularity. Its lifestyle amenities, great schools, and peaceful community atmosphere also draw homebuyers into Cinco Ranch. With new construction in some sections and steady property values, Cinco Ranch real estate may maintain its popularity in the years to come. 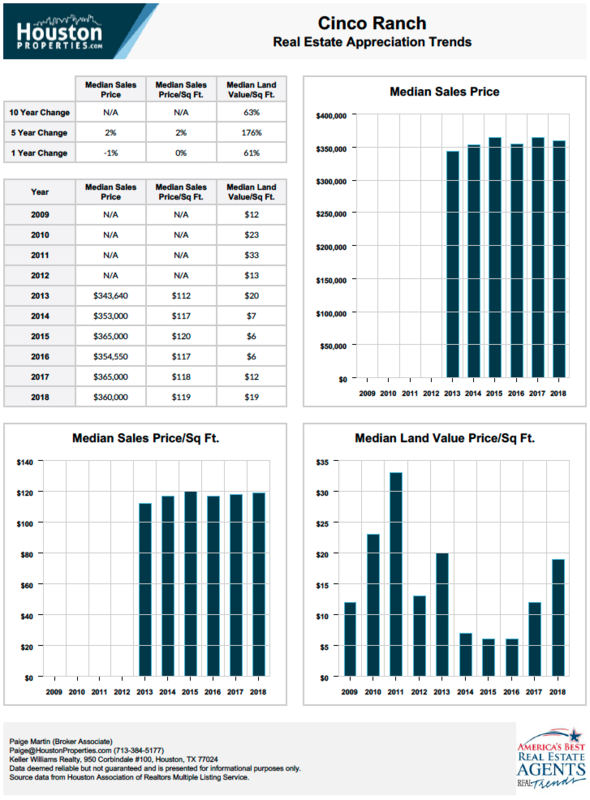 For updated information regarding Cinco Ranch real estate pricing and trend analysis, please contact Paige Martin at Paige@HoustonProperties.com. Cinco Ranch real estate features a wide variety of home styles and floor plans. Different sections are typically under specific home builders so Cinco Ranch homes can range from grand estates and custom-built homes to bungalows and patio homes. Some homes have views of the community’s lakes and golf course. An average home in the master-planned community can feature a 3- to 5-bedroom 2- to 4-bath floor plan. Cinco Ranch homes are typically spacious, with living spaces ranging from 1,500 to more than 4,000 square feet. 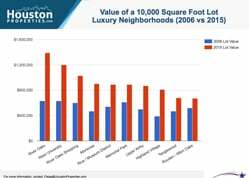 Lot sizes are between 5,000 to more than 10,000 square feet. The most expensive Cinco Ranch real estate are larger: 5 to 6 bedrooms with 5 or more baths, spread over 5,000 to about 7,000 square feet. These properties usually offer equally large lots, from 12,000 to about 28,000 square feet. Cinco Ranch homes tend to lean toward traditional aesthetics with some drawing inspiration from Spanish, Mediterranean, and Colonial architecture. Others adopt more contemporary designs. Cinco Ranch homes for sale can start at around $150,000. The most expensive real estate in the area can be listed at around $2,000,000. Like most master-planned communities in the Greater Katy area, Cinco Ranch is mostly made up of detached single-family dwellings. There are, however, some sections within the community that offer townhome options (Cinco Ranch West and Cinco Ranch Southwest in particular). Cinco Ranch townhomes are typically smaller, with 3-bedroom floor plans and about 1,500 square feet of living space. Lot sizes can be between 2,000 to 6,000 square feet. 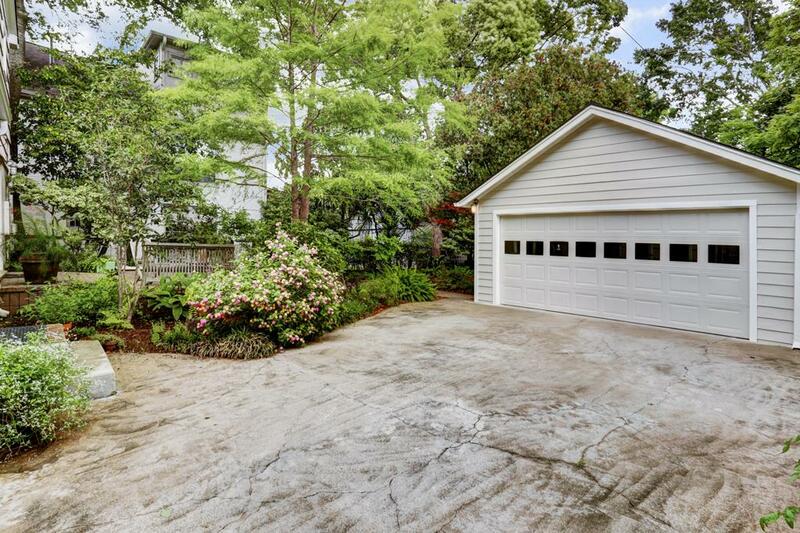 Two-car garages, small yards and driveways are common in Cinco Ranch townhomes for sale. Designs and architectural styles vary, though most feature traditional aesthetics. There are no mid- or high-rise Cinco Ranch condos at the moment. There are some multifamily dwellings like in the mixed use development LaCenterra. In the early 1930s, the area now known as Cinco Ranch was a working cattle ranch, owned by Bassett Blakeley. The Blakeley Ranch covered around 15,000 acres. Five oilmen (William Wheless, J.S. Abercrombie, W.B. Pryon, H.G. Helms, and L.M. Josey) bought the ranch from Blakeley in 1937 and renamed it Cinco Ranch. The Wheless family settled in the area, maintaining the ranch and in addition to farming rice and peanuts. The other families used the ranch as a weekend and holiday estate, staying at the ranch’s large clubhouse. In 1984, the ranch changed hands in one of the largest land transactions in Houston history. Cinco Ranch Venture (U.S. Home, Mischer Corporation, and American General Corporation) bought a 5,000-acre parcel, looking to develop an expansive master-planned community. Cinco Ranch changed hands a few more times until San Diego-based Newland Communities purchased it in 2003. Newland Communities bought an additional parcels of land (492 acres of which aren’t contiguous to Cinco Ranch) for further expansions. Today, the master-planned community spans around 8,100 acres along both sides of Grand Parkway. Cinco Ranch is still growing, and is estimated to have more than 14,000 homes upon completion. Cinco Ranch boasts of a wide variety of community amenities, ranging from water parks, pocket parks, tennis courts, lakes, and miles of trails and greenbelts. Residents from the community’s different neighborhoods and subdivisions have several outdoor entertainment, retail, and dining options to choose from. The biggest among the community’s many lakes, South Lake has amenities for sailing, fishing, kayaking, and paddle boating. Other lakes in Cinco Ranch include Lake Pointe Park Lake and Spring Lake. The Cinco Ranch Beach Club (S Lake Village Drive) and the Lake House (at Springwood Lake Drive) are two popular destinations for swimming and even a quiet day of reading poolside. The Beach Club features a large swimming lagoon right next to South Lake. The Lake House, on the other hand, offers a large saline pool, water slides, and a children’s pool. The Golf Club at Cinco Ranch covers a 167-acre area east of Peek Road and north of Cinco Ranch Boulevard. It is a daily fee course (18-hole, par-71) and features a golf academy for young golf enthusiasts. LaCenterra, Cinco Ranch’s mixed-use development west of Grand Parkway, is an outdoor shopping center with numerous dining and retail establishments. It also has office spaces and apartments. The Villagio and the Village Center are also great places to visit. For more options, residents can opt to take a short drive to Katy Mills, located just off Interstate 10. The shopping mall showcases Marshalls, Old Navy, and several other anchor stores.